Use these geographical conversation cards to learn about the geographical history of the United States as well as learn state facts. 1. Print out and cut up state cards and the Question and Answer cards. 2. Separate these into 5 groups of state cards and their accompanying Q&A cards. Because there are missing cards (AR, KY, NC, NJ, OH), some groups will be missing Q&A cards; be sure that each group has at least one state card with missing Q&A cards. 3. 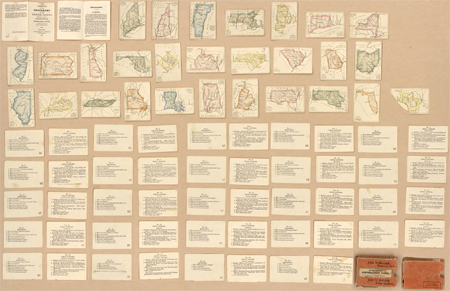 Students will create their own Q&A cards for the 50 U.S. states; be sure to check out these state primary source collections. The teacher may decide the questions in advance or hold a discussion with students to decide together what is important information to know about a state. 1. Display this 1823 Map of the United States of America. As a class, complete a basic primary source analysis of the map. You may have students fill out a paper primary source analysis sheet or digital primary source analysis sheet. 2. Divide students into 5 groups and give each group 5-6 state cards and the available accompanying Q&A cards. 3. Challenge students to find the answers to the questions on the state cards, using the answer cards to check their responses. 4. Direct students to create the missing Q&A cards for the 5 states without them. 5. As a class, compare and contrast the 1823 map with this U.S. map from 1923 that shows the acquisition of territory. Discuss the changes that occurred and how these relate to our current 50 states (you may also wish to discuss the U.S. territories). 6. Instruct students to work in groups to create their own state Q&A cards using these ready-made state flashcards or they can create their own. 7. Allow time for student groups to share their work.